Restless Chatter | Where is my cup of Tea!? So you take a bunch of guys and girls, put them in a place, ask them to date each other and then ditch ’em. That should make a cracker of a show right! Welcome to MTV India’s Splitsvilla, a show so disgusting and degrading, I’d prefer the contestants have a horrifying death. 1. MTV Roadies – Its bigger than Splitsvilla, and puts the contestants through various tasks. Of course there is the cliched reality elements in it in the form of voting out contestants, faking injuries, plotting against each other, horrible background music. But in all, definitely miles ahead. 2. Countless talent shows – They ask you to dance, sing, look good, crack jokes all with the masala factor. But then again, talent does count here. 3. 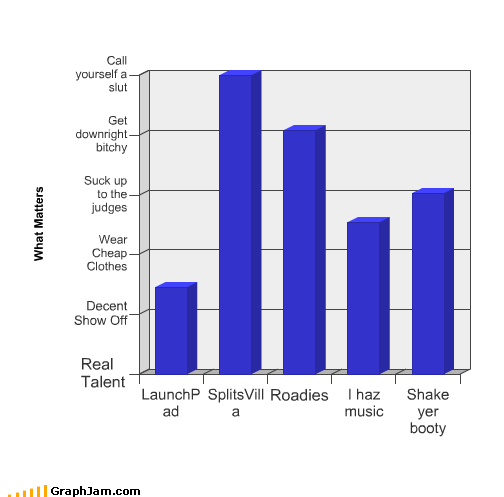 V Launchpad – Supposedly the first reality show for aspiring rock bands, but with the X-factor to attract Indian TV watchers. Its good in bits, and some bands are talented. Probably my number 1 reality show, even though I don’t watch it regularly. Where is my cup of Tea! ?